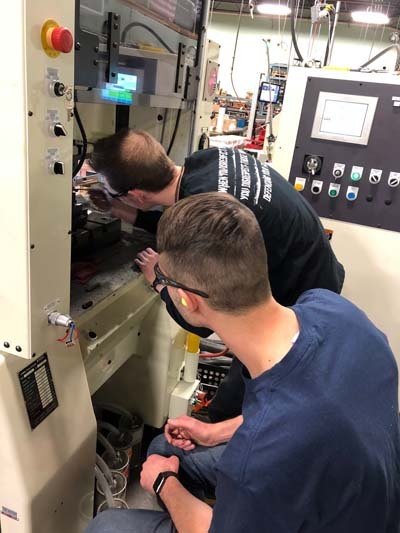 Marion Manufacturing apprentice Zach Vujs is learning how to feed a coil through the company’s newest high-speed Minster press, which Marion purchased in 2016. Photo courtesy of Marion Manufacturing. Quality is everyone’s job at Marion Manufacturing, a high-speed metal stamping firm that ships parts across the U.S. and to far corners of the world. When you ask Marion Manufacturing President Douglas Johnson for some big numbers, he offers up two million parts per day. That’s one part for one customer. It’s a tiny stainless-steel stud, progressively stamped, all day, every day, with all the parts photographed, inspected, rejected, or approved. “It can’t stop,” said Johnson, speaking about manufacturing that part at the 73-year-old Cheshire, Connecticut, firm. Marion Manufacturing is a progressive die stamping company, which grew out of a tiny company founded in 1946 on Marion Avenue by the Cramer family, who got their start at Scovill Manufacturing in Waterbury, Connecticut. Marion’s quality management system is certified to the ISO 9001: 2015 and IATF 16949:2016 (automotive) standards. The company runs a preventive and predictive maintenance schedule on the progressive die tool used to stamp the stud part, said Barry. 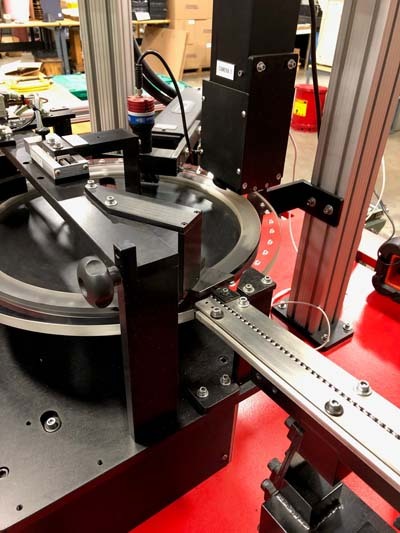 Because ISO and IATF standards are demanding, and because an OEM’s manufacturing pace is typically relentless, Marion keeps replacement tooling components ready so that there are no delays when a tooling component wears out. According to Barry, after Marion stamps about 5 million parts, the tool is taken from the machine and sharpened. After 10 to 15 million parts, tool components that can’t be sharpened again are replaced. Marion’s EDM room maintains a relentless pace to keep up with replacement spare parts. Barry said that being able to maintain stock of replacement parts has helped Marion increase press uptime and consistently hold tolerances within tenths of an inch. “We have the ability to make a lot of replacement components in house,” said Tyler Johnson, a young toolroom apprentice. Marion has a room set aside for its wire EDM equipment. On the wall is a new electronic scheduling system that reminds workers exactly what parts they need to build that day and what’s upcoming. Recent equipment purchases include a new Makino U3 Wire EDM machine and a CNC EDM drilling machine. This new technology has allowed Marion to cut costs of outsourcing tooling components and focus on in-house tool design and builds. Marion’s sorting machine is used to 100 percent sort and pack the second highest running part in the company’s shop. This sorting machine was built specifically for the stud part. Photo courtesy of Marion Manufacturing. Johnson added that Marion’s biggest strength is its ability to compete in high volume, high-speed stamping. A second, high-numbers part (40 million per month) that Marion makes daily is a small component used in the telecommunications industry. Marion has been successful against offshore competition, Johnson said, and has helped several OEM accounts reshore components back to the United States. “We have not only successfully reshored jobs, but we have also gained jobs to where we are shipping parts to other countries because of our quality and price. That has picked up more customers for us,” Johnson said. Marion ships parts across the United States, and to Mexico, Dominican Republic, Puerto Rico, Germany, China, Canada, India, Austria, and Ireland. When the company began in 1946, Connecticut was the home of dozens of clock firms, including the Waterbury Clock Company, which later became the Ingersoll-Waterbury Company, followed by United States Time Company, and, eventually, Timex; Seth Thomas, which gave its name to the town of Thomaston, Connecticut; and the William L. Gilbert Clock Co., of Winsted. Marion’s first five parts were all clock hands. Immediately after the Great Depression and World War II, business was booming. A production run back then was one part up to a few thousand parts. A giant production run was 10,000 parts. Today, a busy stamping company like Marion helps inventors with one-off prototypes while turning out millions of parts each day for its regular customers. Marion moved beyond the clock industry. Today about 55 percent of its business is in telecommunications, while another 10 percent is in medical. Automotive is about 20 percent of the business. The balance is in commercial and new technologies, including solar, wind, battery, and others. The whole world market is bigger today, added Barry, so the market for parts is giant compared to what it was in 1946. “It’s our job to make sure we stay diversified,” she said. 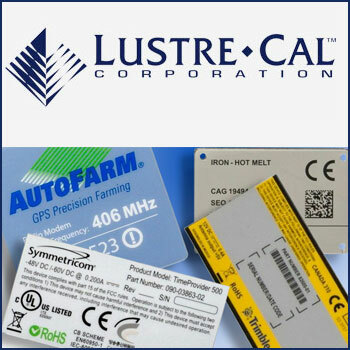 One of the company’s automotive parts is a tin-plated copper stamping that is part of a sub-assembly used in a radio frequency key fob. Another automobile part is a copper electric lamp connector for a lighted car visor. As cars shift from gasoline to electric, the number of parts that automotive OEMs need is dropping. One of the challenges that job shops face with automotive customers is that the automotive OEM always wants to lower the price. Ford Motor Company announced at the Detroit Auto Show in June 2018 it was planning to invest $11 billion in electric vehicles over the next three years. General Motors CEO Mary Barra announced in June that GM plans to release 23 new, all-electric vehicles by 2023. Fiat Chrysler Automobiles said it will spend $10.5 billion to bring out 30 new electrified vehicles by 2020. Porsche and Ferrari are both promising electric vehicles by 2020. China is pushing for 40 percent of its new automobile sales to be electric by 2025. An electric car has no clutch pedal on the floor. It doesn’t have a full transmission and may only have one gear. For example, the Tesla Model 3 has one gear from zero to its top speed. The electric motor has one moving part. Numerous maintenance issues on gasoline cars disappear on electric cars, including an oil change, spark plugs, air filters, timing belts, head gaskets, and fan belts, among others. Marion has already started making one new part that arose from a traditional car part. Johnson said Marion used to make cigarette lighters for cars, and 10 years ago everyone was convinced that business would disappear, at least in the United States. Who smokes anymore? Instead, new cars have three, four, or more electrical ports shaped like the old cigarette lighters. That’s where people plug in their electrical devices. Now automotive OEMs are aiming for electronics to keep people connected. Johnson said Marion expects to find other, similar opportunities in the future as the electric car market grows. “It’s so big. They’re standard power outlets. It’s not fast growth but it’s steady. You see it everywhere now,” Johnson said.